MAKERERE/LIRA – Makerere University’s plant breeder Prof. Phinehas Tukamuhabwa and Mr. Tonny Obua have released the Soybean Production guide in form of a song. The guidebook was published by the duo from the Department of Agricultural Production, School of Agricultural Sciences, College of Agricultural and Environmental Sciences (CAES) in 2015. The song was produced by local musician Jesper Ewanyi in Lira also known by his stage name as Dealrafael JSP. It was released on early this year during the participatory field day to evaluate the 35 Pan-African soybean varieties from six African countries under trial at the Ngetta Zonal Agricultural Research Development Institute (ZARDI) in Lira District. Speaking during the function Associate Plant Breeder Mr. Tonny Obua said, as researchers they turned to music because it is easier for the locals to understand and share via social media, Bluetooth, and radio unlike books and posters. This is because Northern Uganda is the leading producer of Maksoy bean varieties and has enormous untapped potential”, Obua said. 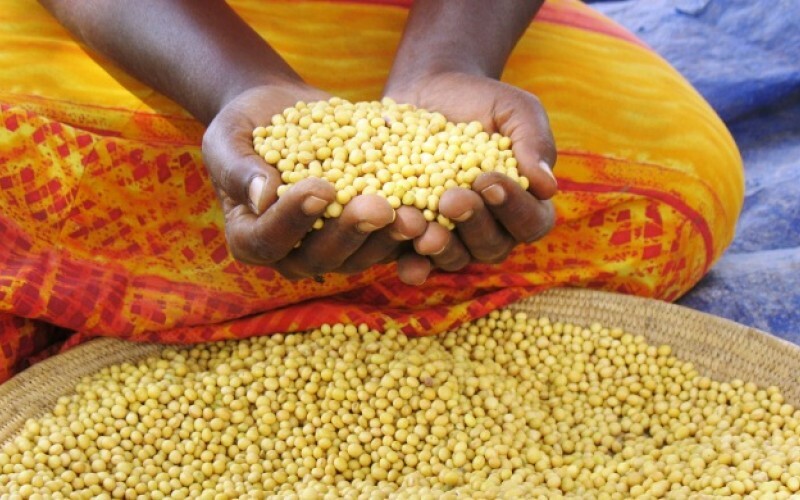 The Luo song describes the varieties as the “golden beans” in the chorus; describing soybean as a miracle crop and highlighting its importance, varieties and advantages. It gives hope to farmers that they will become rich when they grow soybean, and advises them on the need to form farmer groups and adopt bulk selling, good agronomic and post-harvest handling practices as well as storage. Prof. Phinehas Tukamuhabwa has pioneered development of glyphosate tolerant soybeans in Africa, in containment, at Makerere University. While addressing farmers, processors, seed companies, Local government officials and development partners at a similar field day held on at Mubuku Irrigation scheme, Prof. This mugs has hailed youth and farmer groups in Northern Uganda for embracing the Maksoy varieties that have transformed many lives. ”Farmers in Northern Uganda call soybeans “Somalia’. They tell their youth that instead of going to Somalia or Arab countries to do odd jobs, plant soybean because they will become as rich as those who go abroad but they are safer. The choice is in your hands because you have no reason why you should not grow soybean. The market is more than you can produce. So you have no excuse as to why you do not have money.” Prof. Tukamuhabwa stated. The Gross Margin Analysis for soybean production with fertilizer and improved seed indicates that it’s a viable and profitable venture. The total Variation Cost is Shs480,000. The output per acre is 800 Kg; priced at Shs1,200 leading to total revenue of Shs960,000 with a Gross Margin of Shs480,000 per acre. Assistant Plant Breeder Mercy Namara expressed the University’s commitment to develop new varieties and get them to the farmers. She appreciated farmers, processors, seed companies, donors and Local governments for the different roles they play in the soybean value chain, adding that their participation in the field day would help researchers identify the best varieties for release so as to improve livelihoods. “We would like to work together with you farmers as end users of the technologies to understand the specific traits that you are interested in as well as bridge the gap between researchers, farmers, processors, seed companies and other key players”. Namara emphasized the need for farmers to practice good agricultural practices like weeding, early planting and proper spacing if they are to get good yields.